Passengers scheduled to be sailing aboard Holland America’s Prinsendam in mid-October are being notified their cruise has been shortened to accommodate an unscheduled drydock. CND subscribers also read about the world of smokers getting even smaller ... and the CBP nabs deserter. It used to be that cruise lines would issue glossy brochures filled with gorgeous color pictures, and that was about the extent of what they could do to showcase their product, aside from mass media advertising and direct mail. With the advent of the internet, there are dozens of options available to them. Some get made good use of, some no so much. Seabourn has thought out an approach to using video to really show prospective customers what Seabourn is really all about. It’s not just a video brochure, but instead they are producing a series of videos that focus on staff members who talk to viewers about their careers and their lives aboard Seabourn - and something of the subject at hand. Along the way they take you behind the scenes aboard the ships, not just for the sake of going behind the scenes, but because it integrates so well with the story they’re telling. 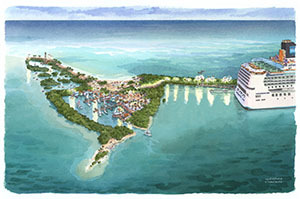 CND subscribers also read about an unusual death on Norwegian Jewel ... St. Lucia expansion ... and bottoms up in Alaska. * Belize, Here We Come! Over the last few weeks we’ve been telling you that Norwegian Cruise Line was negotiating for property in southern Belize for a “private island” type of experience, and a couple of weeks ago we told you they had signed an MOU with the government to develop an island called Harvest Caye off the coast of the Placencia peninsula. Today, Norwegian was ready to officially announce the project and give a few details. The former Pacific Princess, which starred in the Love Boat television series, arrives at the breakers at Aliaga, Turkey on August 6, 2013. The ship can be seen clearly listing due to water it took on during the voyage from Genoa and needed the assistance of tugs to get into the yard. As of August 14, the ship has apparently continued to take on water and is now listing at about a 45-degree angle, and it is feared that it will capsize. MIAMI, Aug. 14, 2013 -- Norwegian Cruise Line Holdings Ltd. (Nasdaq:NCLH) ("Norwegian") announced today the closing of a previously announced secondary public offering of 23 million of its ordinary shares by Star NCLC Holdings Ltd. and certain funds affiliated with Apollo Global Management, LLC and TPG Global, LLC (together, the "Selling Shareholders") at a price of $29.75 per ordinary share. The number of ordinary shares includes 3,000,000 ordinary shares sold as a result of the full exercise by the underwriters of their option to purchase additional ordinary shares. Norwegian did not sell any ordinary shares in the offering and did not receive any of the proceeds from the offering. UBS Investment Bank and Barclays acted as bookrunners and the representatives of the underwriters for the offering. Citigroup, Deutsche Bank Securities, Goldman, Sachs & Co. and J.P. Morgan also acted as bookrunners for the offering. Credit Agricole CIB, DNB Markets, HSBC, SunTrust Robinson Humphrey and Nomura acted as co-managers for the offering. This press release contains "forward-looking" statements within the meaning of the federal securities laws. All statements, other than statements of historical facts, included in this press release that address activities, events or developments that Norwegian expects, believes or anticipates will or may occur in the future are forward-looking statements. These statements include but are not limited to forward-looking statements about the business of Norwegian. There can be no assurance that actual results will not differ from those expected by management of Norwegian. For more information concerning factors that could cause actual results to differ materially from those conveyed in the forward-looking statements, please refer to the "Risk Factors" section of the registration statement on Form S-1 (as amended and supplemented), initially filed by Norwegian with the SEC on July 30, 2013 and the information included in subsequent amendments and other filings. These forward-looking statements are based on and include Norwegian's expectations as of the date hereof. Norwegian does not undertake any obligation to update or revise such forward-looking statements to reflect events or circumstances that occur, or of which Norwegian becomes aware, after the date hereof. One in five Americans suffers from allergies. It is for those 50 million people that Crystal Cruises created their new allergy-friendly staterooms - an industry first. The new category of allergy-friendly staterooms will debut in November aboard Crystal Serenity and will be created from the 70 current “AA” category verandah staterooms. CND subscribers also read about Mein Schiff 3's delay ... and what happens when you put all your eggs - or employees - in one basket. An electrical problem in one of Celebrity Millennium’s two propulsion motors delayed the ship’s arrival into Seward last Friday at the end of a 7-day cruise from Vancouver. Repairs have delayed the turnaround and kept the ship there through Monday night. CND subscribers also read about 50 million people can’t be wrong ... an accident aboard former Pacific Princess claims Two lives ... you can still board in the middle of the Atlantic ... and tearing up the ship.